Yoga pants should be comfortable, stretchy, and durable enough to support you in your practice without distracting you during vinyasa. Our top pick, the prAna Men's Sutra Pants, have a loose, comfy fit and are made of an environmentally-friendly hemp fabric. Shopping for yoga pants is a bit of a mystery, isn't it? I mean, what makes bottoms marketed as "yoga pants" any better than an old pair of ratty sweatpants you've had since college? Do you really need to spend a bunch of cash on a specific style? While you can technically go to yoga sessions in just about anything comfortable enough to do downward dog in, if you're developing a regular practice, you'll probably be happier in pants actually designed for the discipline. That doesn't have to mean dropping a ton of money or springing for anything super fancy, but it's a great idea to pay attention to fit, fabric, insulation, and length while thinking about pants to buy specifically for yoga class. Yoga is different from many other forms of exercise in that it focuses on flexibility and individuality, so you need clothes that will really move with you. Below is a list of the best men's yoga pants that money can buy. Some are pricier than others, but they all have one thing in common - they're comfortable with loads of stretch (but not too much stretch). Why you'll love them: The Men's Sutra Pants by prAna are comfortable, sustainable, and breathable. If you prefer a pair of loose, breathable yoga pants, you can't go wrong with the prAna Sutra Pants. The wide-legged silhouette will give you plenty of wiggle room without causing you to trip over the cuffs when you're trying to step into a forward fold. These pants are made from sustainable materials including hemp, recycled polyester blend, and a little bit of spandex for some very necessary stretch. Other details include front and back pockets, drawstring waist, and "natural odor reducing features." The fit is airy and loose, ideal for the guy who can't stand to leave his college sweatpants behind completely. Faveable also named the Sutra pants "Best men's yoga pants overall," in part because they are versatile enough to use for other workouts and even non-exercise activities — seriously, they're that attractive. The pants have a 4.1 star rating on Amazon based on 170+ reviews and 4.7 rating on the prAna website based on 250+ reviews. "The big plus is that they look great outside of practice," writes one reviewer. "The crotch seam is actually sewn together to give a good shape to the tushie area while giving a bit of room underneath for deep stretches (warrior 2 and crescent lunge no problem) and giving ample crotch room so you aren't exposing yourself to the entire world." Why you'll love them: Sub Sports Men's Compression Leggings are ideal for someone who likes a tight fit, while four-way stretch makes them flexible enough for yoga. On the opposite end of the spectrum we have the Sub Sports Men's Compression Leggings. This is a great pick for people who like a much tighter fit. They are snug but have 4-way stretch that gives you the flexibility and breathability you need to execute complicated yoga poses. The fabric is moisture-wicking and utilizes flat lock seams so you don't experience chafing despite the snug cut. Sub Sports were named "best men's leggings for yoga" on Faveable due to the balance they strike between compression and mobility. This pair has 420 reviews on Amazon and an overall 4.4 star rating. 83% of shoppers found them true to size, though the product description recommends sizing up if you want a slightly less compression on the legs and waist. Why you'll love them: The prAna Vaha Pants are made of sustainable materials in a soft, relaxed silhouette that's comfy enough to sleep in. For the sustainable shopper, we have the prAna Vaha Pants. Like all of the brand's offerings, this pant is made of a hemp, recycled polyester, and spandex blend that's both eco-friendly and cozy to wear. These might be comfortable enough to sleep in, but they look a lot nicer than your average pajama bottoms, with a nice color selection of muted tones, a subtle back pocket and a knitted elastic waist. The look is similar to the other prAna brand pants we featured as our top pick, but a little bit more streamlined — great if you want to subtly wear them to brunch after your Saturday morning vinyasa. The pants are available in size small to extra large with a 30-inch inseam. We do wish they came in a wider size range and some different lengths, but it's worth noting that the waist does have some give thanks to the elastic. Best Products and VeryWell have both featured the prAna Vaha as a top yoga pant pick and this style has a 4.5 star rating on REI. Why you'll love them: Need a bit more breathing room? The YogaAddict Men’s Yoga Shorts are long enough to give you coverage but short enough that you won’t be sweating bullets at the end of class. Shorts lovers will appreciate the longer length of YogaAddict’s Men’s Yoga Shorts. They come just below the knee, giving you a good amount of coverage while you’re twisting and balancing, and plenty of breathing room. The shorts have a cool, casual fit with a drawstring waist and two side pockets. Unlike basketball shorts, these have a slim leg line, so you don’t have to worry about fabric flopping over in your face when you bend over. They come in nine colors ranging from simple black and navy to bright blue and light grey. The wellness experts at VeryWell recommend these shorts, and they have a high 4.7 rating on Amazon based on close to 600 reviews. "These are ‘hands-down’ the most comfortable pants I own," writes one shopper. "The fit is just snug enough for yoga and exercise without feeling restrictive. There is absolutely no binding or pulling of the legs or crotch in even the most extreme stretching positions." Another fan says, "They are super comfortable and ideal for yoga, working out - or a day at the beach!" Why you'll love them: The BROKIG Men’s Zip Joggers are great for yoga because of the breathable fabric and slim fit around the ankles that won’t mess up your flow. Joggers are great for more than just jogging. The BROKIG Men’s Zip Joggers are a great option for yoga because of the breathable cotton/polyester material and the slim tapered fit. There are leg zippers around the ankles to help you do a quick change if you’re always in a rush after class. Reviewers love the fit of these pants and the breathable fabric. A few people had issues with ripping seams and broken zippers, but many of them were able to get the pants replaced in a timely manner thanks to the BROKIG customer service. Some also pointed out that the sizing may require some trial and error, so I suggest doing some research before you order. Overall, they have a 3.7 rating on Amazon based on over 400 reviews. "Love it. Already Bought 2," writes one shopper. "I notice people complain about the zippers but I honestly have not have a problem with it and it been through like 10 wash cycles with each pants. I guess I never tried to even zip it up or down, just left it alone and it all fine." Yoga blocks can help you get into difficult poses and deepen your flexibility or simply provide the support you need. 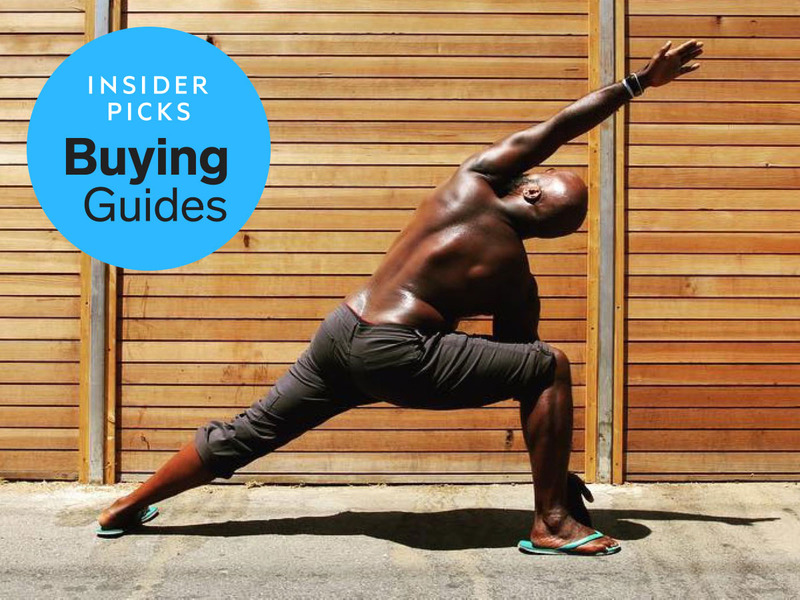 We studied yogi user reviews, product ratings, and top ranked lists all over the internet to come up with our Insider Picks guide to yoga blocks. No matter what you're using them for and no matter what your goals are, there's a yoga block on this list for you.